Fishing is traditionally a male activity—or at least, it is perceived to be—but women also play a crucial role in many fishing cultures. In this Forum, nine women (fishers, fishmongers, processors, chefs, etc.) came together to talk about their skills, knowledge, and experiences in the seemingly male-dominated world of fishing. Claudia Orlandini, of the LIFE (Low Impact Fishers of Europe) platform, facilitated the Forum. Ernestina António Chipita, from Angola, started fishing at the age of 16. Now she is the executive director of the cooperative Centro de Salga e Seca de Apoio às Mulheres Processadoras. Ernestina says that the greatest challenge in her work is being a woman and that, when her women’s association was founded, most men doubted that she and her colleagues would be able to do the work. The reality in Ernestina’s community is that most women play an important role in supporting men’s work, but men often don’t recognize or value this role. 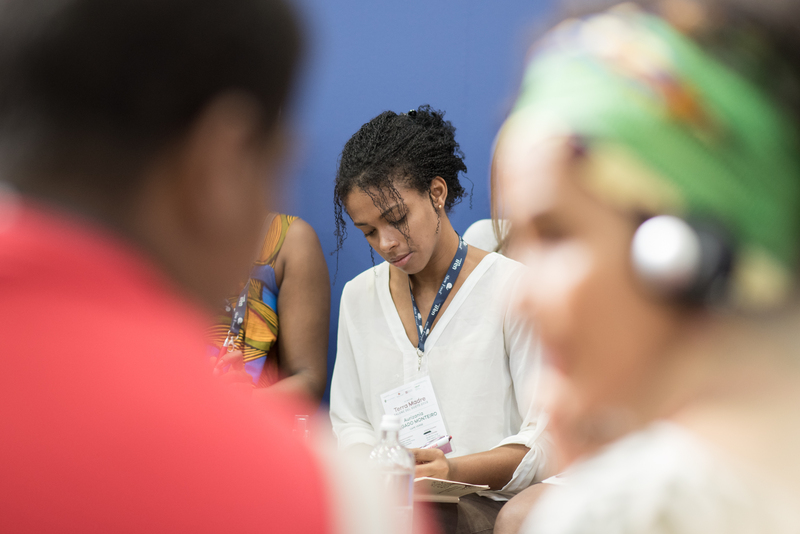 Ernestina fights for women and their rights by bringing them together in community networks. 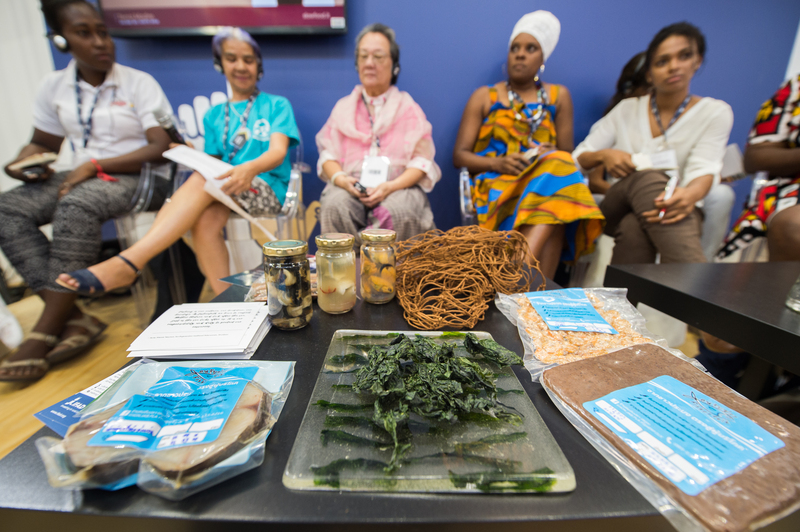 Jucilene Viana Jovelino, from Brazil, spoke about her work as an oyster collector, teacher, and coordinator of the local women’s center of the Quilombo Kaonge Oyster Food Community in Bahía. For Jucilene, the sea represents sustainability. In the past, many women oyster collectors died because of poor working and living conditions. Jucilene is trying to improve these conditions: “We are the ones responsible for our communities, not someone from outside that has learned more than we have,” Jucilene says. In her work as a teacher, and through the activities of the women’s center (where women working in fishing, farming, and other areas come together), she can see that the role of women is changing positively. Women now can earn a living from their work, but the struggle to make their voices heard continues. Adelaida Lim Pérez, from the Philippines, is a chef and food activist, and owns her own restaurant. It is far from the sea, but the idea was to create a space where people could gather to nourish their bodies and souls. “Eating is a political choice,” Adelaida says, and so in her restaurant there is only fresh, natural, regional food. She works to protect a traditional Filipino fish sauce and believes that it is important to engage in a craft that can make people happy. 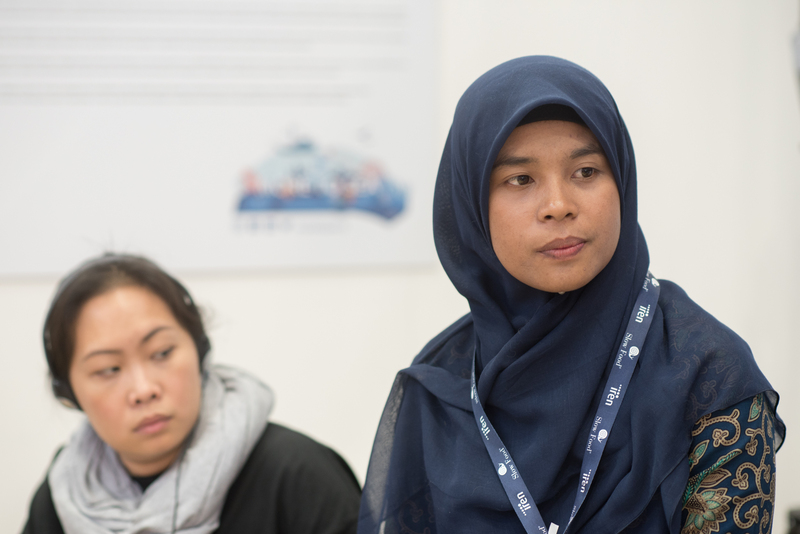 Hasanah Kehmasaw, from the Fisherfolk Social Enterprise in Thailand, is working to build up a trading network of fishers and to protect the rights of the small-scale fishers in her home country. The network helps small-scale producers add value to their products and earn more income. Alice Miller is a researcher and the director of IPNL (International Pole and Line Foundation), an NGO based in the UK. Alice works to make sure that women’s perspectives and needs are accounted for in guidelines, policies, etc. Sustainability mostly focuses on the environment, but social issues must also be considered. This Forum made it clear that gender equality remains a central issue in the fishing sector. Women fight and work not only for themselves, but for their communities. They have always played an important role, and their work must be respected. Hilda Adams, a fisher from South Africa, reiterated that, in order to sustainably manage the seas, all members of the community must be empowered. She expressed the resilient spirit that all of the panelists share when she said, “There is no other place I want to be more, than in the middle of my small-scale fishing community!” Struggles continue, but there are many positive and empowering examples to draw from, including those shared by the inspiring women in this Forum.